We are now located temporarily at the ACAC Annex at 312 Woodworth Avenue, right next door to our new building. Street parking is available, as well as a parking lot immediately behind the building, accessible from Woodworth Avenue via the alley immediately north of the building. All parking is free. Kurt Wassenaar, Jerry Freed and all the workmen were exceptionally accommodating in letting us stay as long as possible in this location, but they need that space to continue their Opera House restoration project work. The good news is that we found a temporary location that will meet some of our needs and get us closer to our new location which is under renovation. 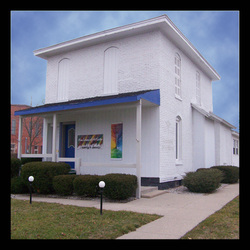 We are able to use office space in the house next to our new Art Center on Woodworth Avenue in Alma. The space at 312 Woodworth is available to us thanks to Bart and Connie Barton and has a fairly large room that can accommodate scheduled 'By Appointment' and small art classes. Larger classes and special events are now held off-site and there will be no gallery area or artist retail sales. 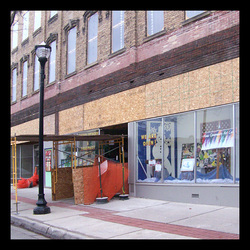 Our old location at 107 E.Superior St.